Whenever people discuss software that they would like to see ported to Linux , they mention desktop publishing (DTP) applications like Adobe InDesign and QuarkXpress. But Linux already supports an application aimed at DTP users. 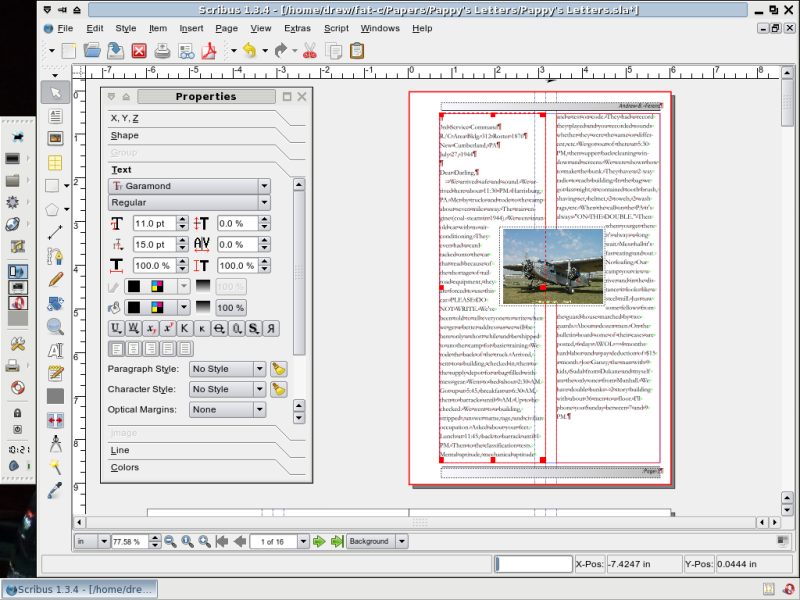 Scribus  is an open-source page layout program that runs on Linux, Windows, and Mac OS X. Is it a viable alternative to proprietary products for professional production work? For nearly a decade, starting in the mid '90s, my primary responsibility at work was editing and laying out graphics and text in documents. QuarkXpress was the first page layout program I used, followed quickly by various versions of Aldus (and later Adobe) PageMaker. A few years ago, I started to work with Adobe's successor to PageMaker, InDesign. From my work, I learned that for a page layout program to be efficient and effective, it must facilitate a workflow that includes importing and consistently formatting text, tables, and illustrations (both in vector and raster formats). Installation was a little tricky because it was not immediately clear how to get the latest version. The main Web page for Scribus  shows version 1.3.3.9 as the latest stable version. However, a news release from May  states that version 1.3.4 is the most recent. The release points to a download page for version 1.3.4 , and that is where I got the source files with which I compiled a package for installation. RPM files for different architectures are available from the same page. Had I not seen a Linux.com article on the release of version 1.3.4, I would not have known that it was available. Version 1.3.4 is a development release, but the distinction between stable and development releases is a subtle one for those not familiar with open source development practices. Unlike word processors, page layout programs presume that most of a document's content is created in other programs. Document authors create text in word processing programs, illustrations in drawing program such as Illustrator and Inkscape, and edit photos in raster image editing programs such as Photoshop and the GIMP. Therefore, it is vitally important that a page layout program be able to import a wide variety of file formats and precisely place them on a page. Scribus handles most common file types correctly. I was initially disappointed when I found that Scribus would not import my Microsoft Word files, since Word is extremely common, and in a production environment, the chances are high that most authors will be submitting their text in Word format. After reading a help file, though, I learned that Scribus uses the Antiword  utility to convert Word binary files to text during the import process. Scribus checks for the presence of Antiword when it starts; after I installed it, Scribus imported Word files without problems. Additionally, Scribus easily handles raster and vector image formats such as EPS, TIFF, JPG, SVG, PNG, and (surprisingly) native Photoshop PSD files. Tables are not handled so elegantly. If you insert a blank table, Scribus simply groups individual text boxes together as cells. You must ungroup them to add text to them. As a result, tables do not import well. The solution is to create tables in another program (such as OpenOffice.org Writer) and save that file as a PDF, which Scribus can import as a graphic. In Scribus, as in many other page layout programs, users must draw frames on the page to act as containers for text and graphics. For many publications, text comprises the bulk of a document and requires the most time for layout and formatting. Drawing text frames and linking them so that text can flow from one frame to the next would be a tedious task, but Scribus has a feature that automates the process. When setting up a document, users can select an option to have text frames automatically drawn on pages. A further benefit of this option is that the automatically drawn text frames are also automatically linked. Keep in mind, though, that automatic text frames work best when the text to be inserted is more than a page or so long. I tried using automatic text frames for a project I'm working on that has more than 40 text files, with many of them shorter than a page. The time I spent unlinking text frames so I could place text from a subsequent file negated the time savings from having Scribus place the text frames on the page. Once text has been imported, you can format it by applying paragraph and character styles. Scribus's styles manager provides a convenient place to create and edit styles, but I found its interface difficult to use. It is not immediately clear that paragraph styles -- which govern justification, spacing, and indentation, among other attributes -- incorporate character styles, which determine font size and color, among other things. More troubling is the fact that changes I made to established styles did not seem to apply consistently to text already formatted with those styles. Master pages are page templates where you can place elements such as headers, footers, and page numbers. When applied to a regular page, those elements are not editable. Scribus handles master pages well, and allows you to create multiple master pages. Unfortunately, there does not seem to be any way to automatically apply formatting consistently to images and other graphics. For example, I like to have each image use the same text wrap settings, and to have those setting be the default for newly placed images. I was unable to get Scribus to set that kind of default. Also, Scribus has only limited support for object effects such as the color of text and graphics boxes. I could find no support for object styles or special effects like drop shadows for text and graphics boxes. Despite some shortcomings in the software, I can cautiously recommend Scribus as a capable page layout program. I experienced some inexplicable crashes, especially when I tried to copy and paste full text frames. If those crashes had not consistently happened, I would more highly recommend the application. Scribus suffers, though, when compared to commercial page layout programs. Its interface is harder to use and less intuitive than PageMaker's or InDesign's. I found it more difficult to design master pages, create paragraph styles, and format imported text than it is in those other programs. One could argue that my complaints reflect a bias based on years of familiarity with Adobe's products, but the development road map  on the Scribus wiki identifies several improvements and desired features indicating the relative youth of this program compared to the mature state of a program like PageMaker. One feature that I consider critical but that I could not find in Scribus is a book utility to keep track of multiple Scribus files associated with a publication. A book utility would be most helpful in situations where each chapter of a document gets its own file. It would track those files and automatically ensure that mater pages, styles, and pagination are shared among all the files in the book. On the other hand, Scribus is an incredible value when comparing cost versus capability -- especially because it is the best page layout program for Linux users. Furthermore, Scribus users have addressed many of the shortcomings by writing Python scripts that extend Scribus's capabilities and interface and posting them on the Scribus wiki . Overall, the development team has done a fantastic job creating a capable DTP program. With time and further development, I have no doubt that Scribus can be as full-featured as other alternatives.